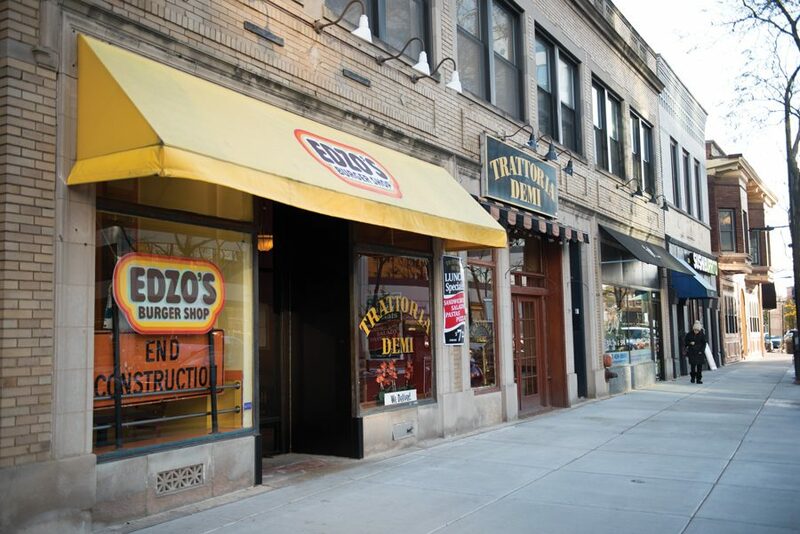 Edzo’s Burger Shop, 1571 Sherman Ave., borders the Fountain Square construction. General manager Jeffrey Wilson said the restaurant has experienced a drop in business since construction began. As construction on Fountain Square lags behind schedule, nearby Evanston businesses expressed concern with the loss of customers and possibility of closure. City officials initially projected the renovation would be complete by December, but a series of weather and coordination issues have led to delays. Construction is now set to end in May 2018, five months later than local businesses expected. Denise Sieja, owner of Trattoria Demi — located at 1571 Sherman Ave. — said she was “nervous” about “surviving the renovations” through the summer because construction teams blocked entrances and took over the sidewalks and parking spaces in front of the restaurant. Trattoria Demi’s revenue decreased about 30 percent compared to last year, Sieja said, which translates to thousands of dollars. She said the restaurant suffered because it was unable to open its outdoor dining during the summer. “Everything has been made almost impossible, from deliveries of the necessities we need to operate to parking,” Sieja said. She said the already “horrendous” parking situation near her restaurant was made worse after construction led to the removal of almost all available spots. Sieja, who received a ticket herself after parking outside the restaurant, added that she doesn’t expect parking to improve after the renovation due to a narrowing of lanes. Jeffrey Wilson, general manager of Edzo’s Burger Shop, faced similar problems. He said construction has caused parking problems and a decrease in foot traffic for Edzo’s, 1571 Sherman Ave.
Customers run the risk of receiving tickets for parking their cars in spots that don’t have meters yet, Wilson said. He said Edzo’s began offering curbside pickup in response to the decrease in parking. The new service allows customers to remain in their cars while an Edzo’s employee brings out their orders. This ensures customers don’t get ticketed, but is “definitely not convenient for us,” Wilson said. On a more personal note, Wilson said he was upset that construction continued during Northwestern’s homecoming weekend. The construction “killed” business on a weekend that is normally one of the busiest, he said. Wilson also described a time when construction workers busted a water line and didn’t inform Edzo’s. As a result, he said, the shop’s cooler broke and cost the business “a lot of money” to replace the equipment. Lara Biggs, chief of the city’s Engineering and Capital Planning Bureau, said Edzo’s owner Eddie Lakin notified the city of the incident, but she is not aware of the exact damages. Biggs said the city requires construction contractors to maintain insurance for incidents of property damage, and staff gave Lakin directions for filing a claim with the construction contractor and its insurance company. She did not know whether Edzo’s completed that process. Ald. Donald Wilson (4th), whose ward encompasses Fountain Square, said equipment on the sidewalks and other areas outside of the construction site have made it difficult for residents to navigate the square, but that the city is responding to the concerns of businesses. He said the city has begun issuing violations to the construction company when it takes up spaces outside the construction area. City staff also helped Boltwood co-owner Brian Huston — who cited frustrations with parking and outdoor seating — mitigate the construction’s impact on his restaurant. Huston said the city refunded a $400 outdoor dining permit for this past summer, though his business stood to profit much more by having that seating available to patrons. Still, Donald Wilson said he was “frustrated” with the delays. Both Donald Wilson and the business operators said the area will be a great asset once completed, but that future seems far off, especially for local businesses who feel the brunt of the impact of construction. This story was updated at 4:15 p.m. with comments from Lara Biggs.